Of all of the genres of historical fiction, biographical fiction is my favorite. I love following the ups and downs of a character’s life and seeing how they change over time. 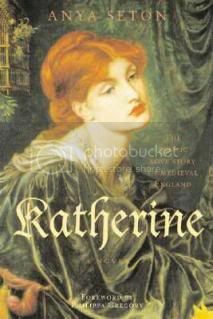 Anya Seton’s Katherine is a classic of the genre, and even though I’ve owned a copy for several years, I had never read it. Katherine de Roet is an orphan, one of two daughters of a knight and a Frenchwoman. Her sister Philippa found a place with the Queen, but younger Katherine was raised in genteel poverty in a convent. In her early teens, she is called to court to join her sister. Having spent much of her young life cloistered, Katherine knows little of the outside world, and she soon finds herself eagerly absorbing all of the joys of being a teenage girl in a medieval court. She’s easily charmed and hopes to make a good match with an eligible gentleman, but she catches the eye of Hugh Swynford, a burly, uncouth knight who is used to taking women by force rather than winning them over by chivalry. Though marriage to Hugh would be an advantageous match – Katherine has no dowry and no title – she rejects his proposal. But young women in medieval England have little to say about their destinies, and Katherine is soon wed to Swynford. John of Gaunt, the Duke of Lancaster, and his wife Blanche attend the nuptials, and in an elegant bit of foreshadowing, Lancaster sweeps Katherine into his arms after the ceremony and kisses her passionately. Hugh tries his best to be a good husband, and after a while, Katherine tries her best to be a good wife. But their marriage is founded on Hugh’s physical attraction to Katherine, not on love, and he’s a clumsy lover -- hardly the romantic swain that Katherine desires. She does her marital duty, but is quietly relieved when Hugh goes abroad to serve the king in battle. Life at Kettlethorpe, the Swynford family manor, is difficult, and Katherine does her best to reign in the serfs who work the land, but there is only so much a woman can do. While Hugh is away, Katherine visits the Duchess of Lancaster at court, and the two become friends, bonding over their pregnancies. The time spent with Blanche gives Katherine a taste of court life, and helps to eliminate some of the naivete left over from her convent upbringing. Hugh’s return to Kettlethorpe coincides with the return of the plague to London and the countryside, and the nobility quickly flees the city to avoid contracting the deadly disease. When word reaches Katherine that Blanche is en route to Bolingbroke, she goes to join her – only to find a tragic scene. Plague is fully entrenched, and Blanche is dying. Katherine, who survived a childhood bout of plague, has immunity, so she serves Blanche as best as she can. After Blanche’s death, Katherine is appointed governess to Blanche’s two daughters, which brings her into the path of the Duke of Lancaster. Despite her attraction to the Duke and her disdain for her husband, Katherine does not pursue Lancaster. One of the remnants of her convent upbringing that court life has not destroyed is her belief that marriage is sacred. Even though her marriage is loveless, she refuses to break the vows that she made to Swynford. Eventually, unable to bear his love for Katherine, Lancaster has Hugh poisoned – a plot that Katherine knows nothing about. She nurses her husband through the bloody flux that takes his life – a condition that has plagued him, off and on, for years. With Swynford out of the picture, Lancaster ramps up his pursuit of Katherine, who soon gives in to his attentions. After a romantic period of travel through France, the two are inseparable. The only hitch is that Lancaster must remarry to cement an alliance with Castille, which does not sit well with Katherine. From here, Seton follows the ups and downs of the long-standing relationship between Katherine and Lancaster. She endures his marriage to Costanza of Castille, serving as his mistress and bearing him four children. They are steadfast in their love for each other, until Katherine is told that her husband was murdered at Lancaster’s request. Katherine is unable to bear the thought that the great love of her life is responsible for Hugh’s murder, and her eldest daughter Blanchette suffers a breakdown from the news of her father’s murder. Katherine disappears from Lancaster’s life and plunges herself into intense penance for the things she has done in the name of love. Though the romance between Lancaster and Katherine does end happily, there’s much that happens along the way that is far from pleasant. Biographical fiction demands fascinating source material, and Seton has it in Katherine Swynford’s life. She lived through, and was part of, some of the most exciting, tragic, and devastating events of the medieval era – the plague, the Peasants’ Revolt, the Hundred Years’ War, and the reign of Richard II. Seton’s pacing is brisk, and the descriptions of medieval life are detailed enough to give readers a feel for the setting, but not overwhelming enough to bog the story down. Though additional details regarding Katherine’s life have been revealed by biographers, Seton does well with the available source material, staying true to known details yet providing reasonable embellishments or hypotheses about what may have happened. The secondary characters, including the great writer Geoffrey Chaucer, are fully fleshed out, adding further detail and ambiance to the novel. All in all, Katherine is an outstanding novel that has stood the test of time, and I’m glad that I took the time to read it. If you are a fan of biographical fiction, I highly recommend this book. Katherine is one of my absolute favourite books. The historical detail is so rich and vivid that Seton really brings the 14th century to life. I'm glad you enjoyed the novel, too. Anya Seton is a new author for me as well. Time I went looking for her. I first read this book many years ago and it's been a favourite ever since....and reread several times. This book is on my all-time favorites shelf, but I think it's time to take it out and enjoy it all over again. Glad you finally read it and liked it so much. It's a classic. Putting this on my request list! Thanks! !